Some of you already know I’m in Hawaii with my boy. We’re here dog-sitting (really) and making the most of everything Oahu can offer and high up on that list would be food. I’m not an expert on Hawaiian cuisine but I did a little research before I arrived, the last thing I want to do is come all this way and eat what I could easily get back in California. Wherever I travel to I always like to try and eat at local spots and hole-in-the walls. There’s definitely an Asian feel to some of Hawaii’s food and that’s cool with me. 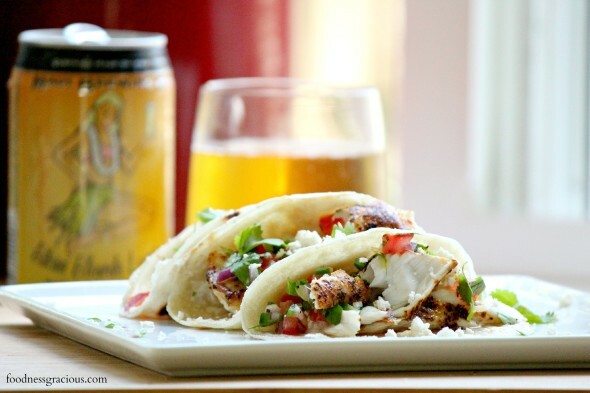 But for now Cinco de Mayo is right around the corner so I’m feeling some island inspired fish tacos. I found a really cool seafood shop in Kailua called Hibachi, the fish is super fresh and all locally caught. They also have rib eyes marinaded in a thin teriyaki sauce that turns the meat to a rich aged black color. I picked up some Hawaiian mongchong which is a flaky white fish (halibut or tilapia would work just as well) and gave it a simple season then pan seared it quickly on either side. Remember I’m not in my own kitchen so I felt like I was taking part in an episode of Chopped without the mystery basket. I topped the tacos with some spicy pineapple salsa which Quinn loved…even with a whole jalapeno added to it. 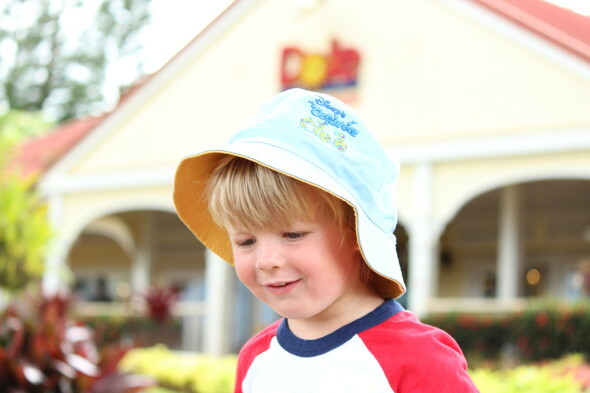 We’ve been busy since we arrived which is the key to guaranteeing your three year old will fall asleep easily at night! Oahu doesn’t seem to big and I think we’ll cover it easily in two weeks. I love driving along the coast and stopping at some of the roadside stalls which offer everything from the best sweet buttered shrimp I have ever tasted, to juicy pineapples and shaved ice. Quinn always loves to gather sticks, sometimes so many he can hardly walk. 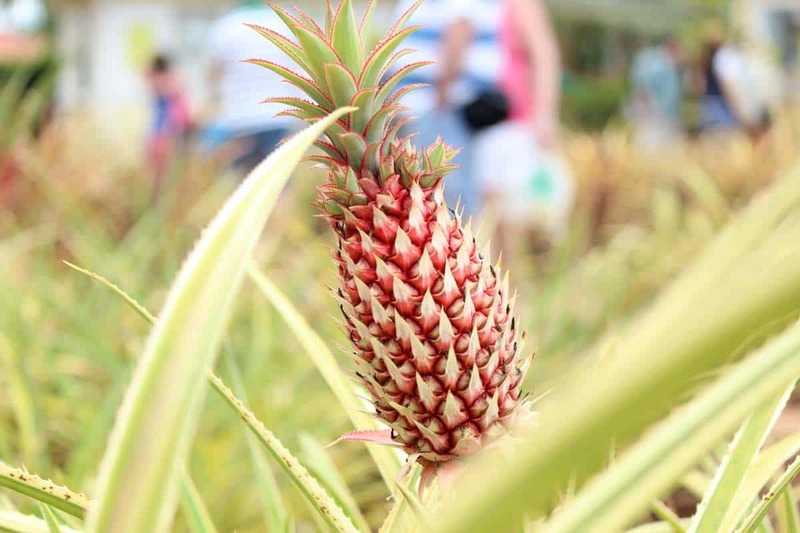 A pineapple from the Dole Plantation. This place is a little on the cheesy side but their signature Dole Whip ice cream is worth going for! Loco Moco. 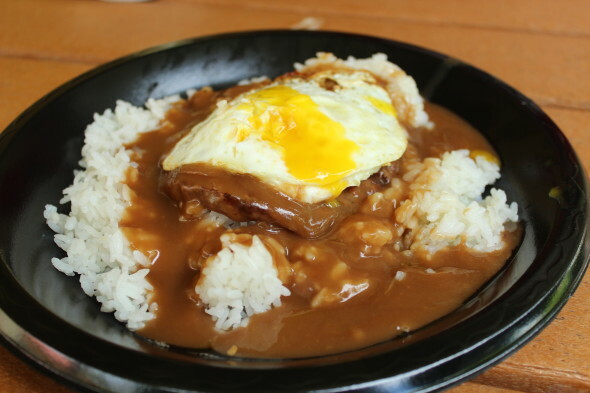 A hamburger patty topped with brown gravy and a soft fried egg and served with rice. Tasty but sooo heavy. 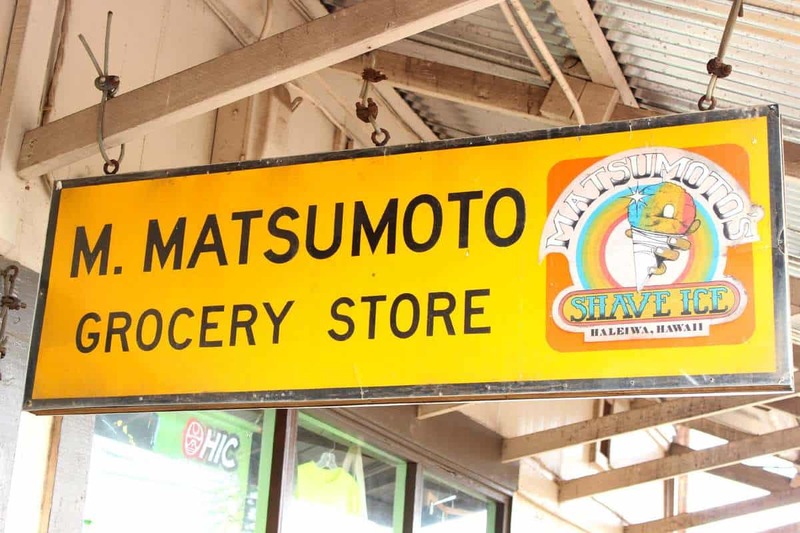 Mamoru Matsumoto’s original shaved ice store. Founded in 1951 and still going strong serving up to 1,000 customers per day. Fish tacos are always an easy option for dinner, so try these Hawaiian versions. Heat a saute pan over a high heat and add the canola. Season both sides of the fish and place it gently into the hot oil. let it cook untouched for 5 minutes before flipping it and cooking for another 5 minutes. Once the fish is cooked let it cool for a few minutes. Using your fingers break it into large chunks. 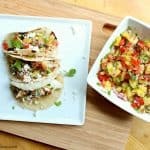 Place some fish on to a tortilla and top with some of the pineapple salsa. Garnish with some Cotija cheese and fresh cilantro. What a sweet little man. Instagram away I say. And looking forward to more fish recipes please, love the Hawaiian flavors. Love this! You know I grew up in Hawaii, right? lol And Joe lived on Oahu for 10yrs! Hope you go to Aoki’s! 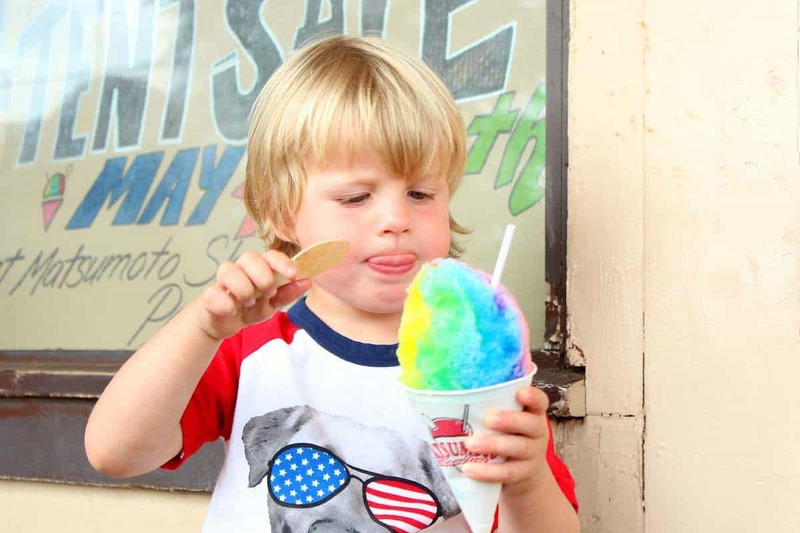 It is the spot for shave ice and red beans! Have a blast you 2! Gerry – please post away! Can’t wait to see all the photos. What a wonderful get-a-way, and your son is absolutely adorable. What a wonderful time for you both. And … I love the fish tacos and salsa! Drool worthy! Yes – more pictures of your adventure – I’ve never been to Hawaii and your pictures are terrific. A FUN time for both of you…your son looks so sweet and happy dogsitting and ice-eating! Look at you going straight to Hawaii from Temecula! Take the wee one to Bubbies for some mochi (ice cream balls). We celebrated Brynn’s 21st birthday last summer in the islands, and one of our relatives (who was raised in Oahu) brought them *Brynn is a mochi aficionado extraordinaire. It has been around for 27 years and they are definitely the best we’ve ever had. And make sure to slather-up your son with sunscreen before you go out everyday (he’ll burn easily out there!). Good work, Dad! How awesome that your dog sitting in Hawaii of all places! I’ve always wanted to visit Hawaii… I think I’ll have to make this to feel like I’m really there (in spirit)! Dog sitting in Hawaii?! Rough life, Gerry! 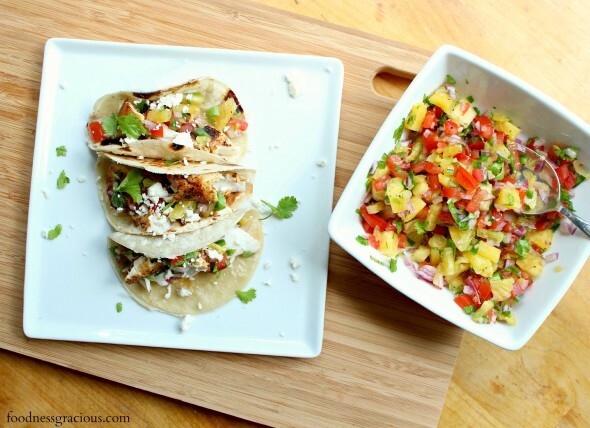 ;) Love these tacos and that pineapple salsa…yum! What a sweet dog watching gig! Whenever I plan on going anywhere I always plan what I’m going to eat, often times before I get my hotel so I totally understand your research :) Hope you and your sweet little guy have a blast and it was lovely to meet you too! Well, I know you guys have the time of your lives. I don’t blame you, not one bit, who wouldn’t? Enjoy your vacations and bring back some sun and sand with you! Your trip looks AMAZING!!! And these tacos?! I need them. Your boy is adorable! Looks like a successful trip- and your photography is wonderful. 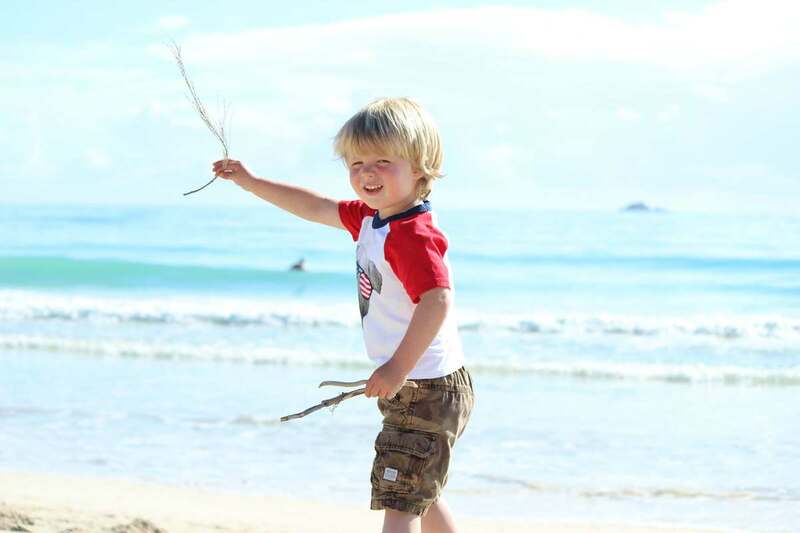 okay first of all Quinn is the cutest boy in the world- right up there with mine of course! Seriously, these look delicious! This recipe sounds absolutely scrumptious. And please, post away with sunny pics. I don’t mind living vicariously through others. Was wonderful to meet you at BTP1. Hope our paths cross again soon!! Such a fabulous recipe and these pics are so great! These look SO good! I really, really wish I was in Hawaii! It was so great meeting you at BTP1 this year. I’m even happier to have found your gorgeous blog. So beautiful and well done! Your kids are so lucky to have such an incredibly talented cook for a dad. Keep up the great work (and great eating)! You’re an inspiration. Love the tacos btw. That salsa is killer. You are totally helping me finally our menu for the “Hawaiian-ish” theme of our blogger party in Tennessee for Memorial day weekend! Keep it up! Plus,…..blogging while YOU ARE IN HAWAII? You get bonus points for that, G.
Ha, that’s what happens when you don’t set up any guest posts lol! Thanks for the comments, the haupia dip isn’t too sweet so you could add more sugar or a splash of vanilla if you like. I’m working on an ahi poke salad post right now and it should be up by tonight. Glad to help and hope the party goes well :) Also Chris if you don’t mind can you let me know if you receive this reply directly, since my blog makeover I’ve always wondered if my replies go to the commenter as I know I get them from other bloggers with out having to go back to the post to see if a reply has been left. Thanks! !